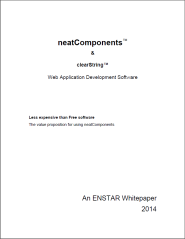 What is the ‘neatComponents’ and 'clearString' value proposition? neatComponents is a robust, powerful, easy to use, comprehensive development platform for web based business applications that any business can use to build almost any business model in a fraction of the time and expense of conventional coding by a programmer. How can neatComponents be less expensive than free software? neatComponents reduces your biggest cost - labor. That's the cost of manual coding by a programmer. neatComponents gives you the skills of an experienced coder - instantly. The key to understanding the value proposition for neatComponents is that to reach the level of coding required for modern, secure business applications requires years of experience and a great degree of skill. neatComponents encapsulates that knowledge into its components. neatComponents gives you that capability without the cost.